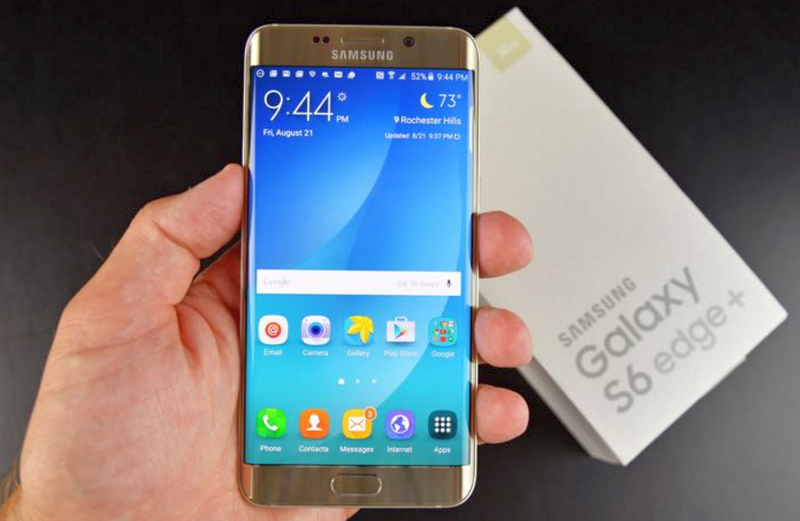 Samsung Galaxy S7 and S7 EDGE Manual - Samsung Galaxy S7 Quick connect - Galaxy S7 and S7 edge to have memory that expands at your will. The incredibly fast processors and huge RAM keeps everything running smooth even when running at full capacity. While the bigger battery keeps you going for longer.Mobile gaming just got a whole lot better with a dedicated game control center and gameplay recording. And with the Galaxy S7 and S7 edge's powerful processor, it just got highly realistic. Here The Samsung Galaxy S7 Tutorial to connect with other devices . Quickly search for and connect with nearby devices, such as Bluetooth headsets or TVs, using the Quick connect feature. If the device you want to connect does not support the Quick connect feature, activate its Wi-Fi Direct or Bluetooth feature before launching Quick connect on your device. 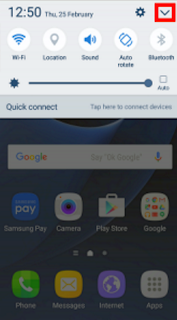 Open the notification panel and tap Samsung Galaxy S7 Quick connect. The Wi-Fi and Bluetooth features are activated automatically. If Quick connect is not visible on the notification panel, tap → EDIT and tap the Quick connect switch to activate it. Tap Scan for nearby devices. If there is no previously connected device, the device will automatically search for nearby devices. Select a device from the list and connect to it by following the on-screen instructions. The next steps may vary depending on the connected device. To change your device’s visibility setting, tap MORE → Settings → Device visibility, and then select an option. 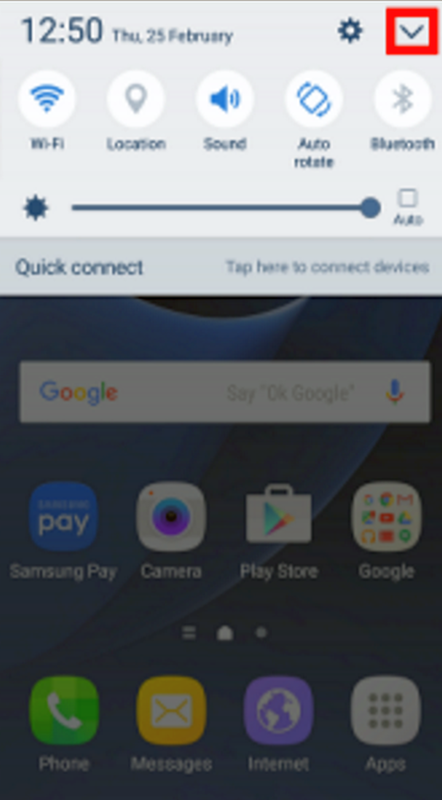 1 Open the notification panel and tap Samsung Galaxy S7 Quick connect. 2 Tap Scan for nearby devices. 3 Select a device from the list of detected devices. 4 Tap Share content and select a media category. 5 Follow the on-screen instructions to send content to the connected device. The next steps may vary depending on the selected media category. Tutorial Connect your Samsung Galaxy S7 or Samsung Galaxy S7 EDGE and a TV to view the device’s content on the larger screen. You may be able to use more features depending on the connected TV. 1 Turn on the TV and place your device close to the TV. 2 Open the notification panel and tap Quick connect → Scan for nearby devices. 3 Select the TV. The list of features you can use with the TV appears. 4 Select a feature and follow the on-screen instructions to use the feature. Available features may vary depending on the TV. Samsung Galaxy S7 Smart View: View your device’s content on the TV screen. You may need to activate the Screen Mirroring feature on the TV depending on the TV you want to connect. If the TV does not support the Screen Mirroring feature, use compatible accessories to enable the feature. Compatible accessories include HomeSync and an AllShare Cast dongle. Samsung Galaxy S7 TV to mobile device: Watch TV on Samsung Galaxy S7 screen. You can continue watching TV within the allowed connection range. Samsung Galaxy S7 Control TV: Use your Samsung Galaxy S7 as a remote control for the TV. TV sound to mobile device: Listen to the sound via the device’s speaker while watching the TV. You can connect a headset to the device so that others do not hear the TV sound. Samsung Galaxy S7 Briefing on TV: Set the TV to turn on automatically according to the preset time set on your device and to display the time, weather, and your schedule information on the screen. To use this feature, your device and the TV must be connected to the same access point. Register TV / Deregister TV: Register the TV to your device to use additional features, such as Control TV and Briefing on TV. Some files may be buffered during playback, depending on the connection. If the TV does not support High-bandwidth Digital Content Protection (HDCP), you cannot view Digital Rights Management (DRM)-protected content on the TV. If you register a TV to your device, you can more easily connect to the TV while playing content. When your device recognises the registered TV while you are watching content, the icon will appear on the device. Tap the icon to stream the content from your device to your TV. • This feature is supported only by the device’s default gallery app. • When the registered TV is connected to an electric socket, you can use this feature even if the TV screen is turned off. Samsung Galaxy S7 Share content by using various sharing options. The following actions are an example of sharing images. You may incur additional charges when sharing files via the mobile network. 1 Tap Gallery on the Apps screen. 3 Tap Share and select a sharing method, such as Bluetooth and email. Simple sharing: Share content with your contacts. To use this feature, your phone number must be verified. If the recipients have not verified their phone numbers or if their devices do not support the feature, a link to the files will be sent to them via text message. The link will expire after a certain period. Smart View: View your device’s displayed content on a larger screen via a wireless connection. Nearby sharing: Share content with nearby devices via Wi-Fi Direct, Bluetooth, and more. Print: Print content using the printer plug-ins installed on the device. 4 Follow the on-screen instructions to share the image with others.